Synopsis: Two boys. Two secrets. I picked this book up as I met Lisa, the author, yesterday! In fact, I just want to say a little bit about that before I start. I was lucky enough to travel to Liverpool last night to meet four absolutely amazing authors, Jandy Nelson, Lisa Williamson, Sara Barnard and Cathy Cassidy! I didn’t even know Cathy was going to be there so I didn’t take a book, but she signed a piece of paper for me and I had a photo with her! I still feel, this morning, like I won some kind of prize by meeting them, haha. And JANDY NELSON HUGGED ME GUYS. Anyway, I’m going to try and stop fangirling now – on with the review! The plot…although a little slow at first, really picks up around the halfway mark! I sped through the final 200 pages and felt really immersed in the story. The only criticism I have is guessing a couple of plot twists before they actually happened – but only around 10 pages before so it wasn’t such a big deal, I still found a great element of surprise in many parts of this book. The characters…I adored them! Lisa does a great job of making them relatable to all readers, whether they’re straight, gay, transgender or not. I really felt close to David (a little more than Leo, I admit, as I found him quite guarded even in his writing), which surprised me a lot – and I really wanted to know what was going to happen to him and his family. The writing…it’s great! No, I didn’t pick up on loads of amazing quotes or outstanding pages, but that’s exactly what this book needs. With the plot and characters not exactly being “typical” teenagers, the writing is what makes this book relatable and easy to read. Something I liked…I love the name of this book, actually. Aside from that, David. He’s so sweet and lovely and I found my heart going out to him throughout the book. Something I disliked…part of me wishes this book ended a chapter earlier, actually. And another part of me would have liked the book to have ended *SPOILER HERE* maybe on a hopeful note for Kate and Leo to have a relationship. Maybe it’s just me, but I think they would have been perfect for each other! 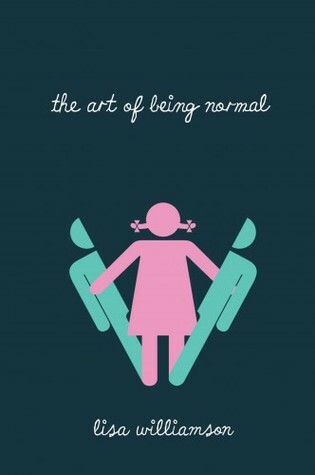 My thoughts…The Art of Being Normal is an all-round heartwarming book. The idea is great and is executed perfectly by Lisa. Also, David and Leo were amazing main-characters and I wouldn’t want this story to be told by anyone else.